Blogging as a beginner can feel overwhelming at times, as you need to learn and understand so many new blogging related concepts and process so much information all at once. Blogging changes your perspective and lifestyle. You change a few habits as well; like instead of watching an online TV series in your free time, you now sit down to write a new blog post. Instead of scrolling through your Instagram feed, you spend time on brainstorming new ideas to improve your blog. You spend most of your time, energy and efforts on blogging or doing things related to blogging. You are ready to go to any length to make your blog successful. And you like doing it. Writing a new blog post fills you up with positive energy and hitting the publish button boosts your adrenaline rush. Blogging makes you feel good. 1. Brainstorming on domain names. You pick a suitable name. You like it. You are sure that this name is going to give your blog an awesome feel and will eventually become a brand. You think about it all the time. In fact, you say the name for so many times that you end up experiencing semantic satiation. So you go on a hunt to find another cool name. After days of hunting and shortlisting different domain names, you finalize one name. Elated, you go to a web hosting site to buy it. But to your horror, you find out it's already taken. (Damn it!) You buy the next ‘good enough’ alternative and convince yourself that it’s the content of the blog that matters the most, and not the name. You do research on all the good web hosting sites. You understand that self-hosting is a very important investment and it needs to be done in the right place. You seek advice from your newly made blogger friends, ask questions, read reviews on various forums, etc. Even one bad review makes you skeptical while considering a particular web hosting site. 3. Every thought is a potential blog post topic. Be it while walking on the street, taking shower, shopping, eating lunch or going to bed, you constantly try to come up with unique ideas. You try to analyze every thought you have and note it down as fast as you can so that you can make a blog post about it later. You try to be as consistent as possible. No matter how tired or drained you might feel, you put in your best effort to write new posts every week. You constantly push yourself to write even if you can’t think of anything to write about. Because all the new bloggers and even the established ones know how important it is to be consistent. Keep pushing Y'all. You spend most of your time trying to figure everything about Search Engine Optimization. Sitemaps, ranking, keyword research, permalinks, etc. Some people even hire experts to help them out. Because just writing quality posts isn’t enough anymore. Little tweaks here and there are essential. You go through every guide on the internet to learn about SEO and optimizing your blog for maximum reach. 6. Utilizing every last bit of Social media. You promote your blog vigorously on every social media platform possible, as the majority of your blog traffic comes from social media. Because getting organic traffic isn’t exactly a piece of cake when you’re a new blogger. You spend hours on social media; promoting your blog posts, interacting with other bloggers, reciprocating likes, shares, and comments. You spend half of your time on creating new blog posts and the other half on promoting them on various social media platforms. 7. Exploring guest blogging opportunities and ways to increase traffic. You try your best to reach established bloggers for guest posts and creating back-links. Networking and making new blogger friends is always on your mind. You join every blogging related Pinterest group board, Google plus community, Facebook group you can find. Your Facebook feed gets filled with notifications from these blogging groups. In fact, you don’t even see the posts from your friends in your feed anymore, it’s mostly the threads from blogging groups on Facebook. The first thing you do in the morning is to check your mail. You eagerly look for new comments or any feedback on your latest blog posts. Oh, the joy of a new comment notification! You keep track of every comment on your blog. When you are a new blogger, every new comment brings an affirmation that you are starting to reach more people and your blog is growing. Increasing traffic= happy you. Day by day, seeing the steady increase in your blog’s traffic makes you ecstatic. But it makes you even sadder to see 0 traffic on some days. However, you should never lose hope. Low traffic shouldn’t stop you from working hard to make your blog successful. 10. Exploring various ways for monetizing. You sign up for all major affiliate programs. And eagerly wait for people to click on your affiliate links. You enthusiastically sign up for AdSense. You get a little disappointed when you receive the rejection mail. But you continue to work on your blog and make the necessary changes. And when you finally get the approval mail, you become super excited and put all your focus on getting maximum traffic. Amongst all the exhilaration you find from blogging, there are days when you feel discouraged and you feel like an unworthy blogger. You think you are not a good writer or have any good ideas. But you need to believe in yourself. Generating more traffic or establishing yourself as a competent blogger is going to take some time. You don’t want to quit midway and regret not utilizing every opportunity or not pushing yourself hard enough. Keep going and you will definitely find new ways to grow and improve yourself as an awesome blogger. Hang on, it’s going to be one hell of a ride. 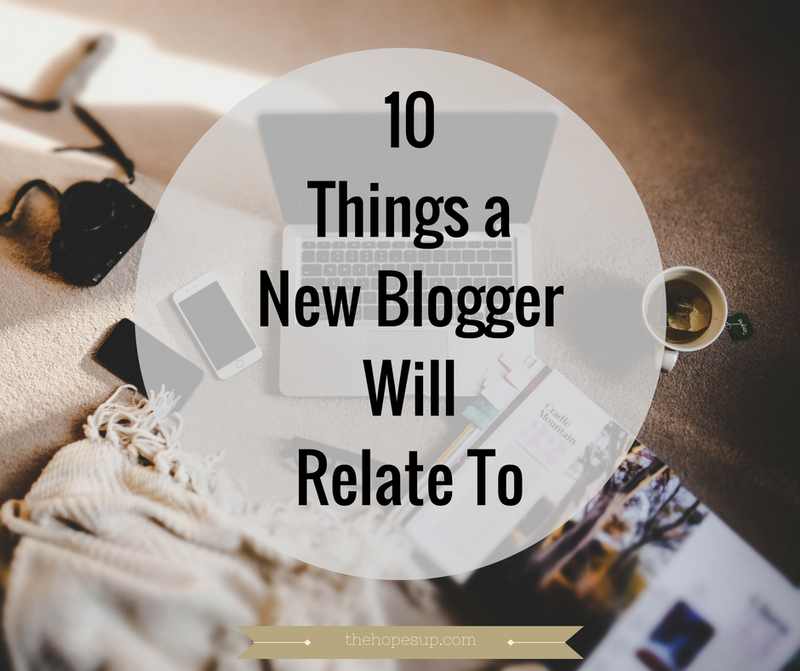 Are you a new blogger? What's your experience been like in the blogging world till now? Liked this article? Don’t forget to share it with others. I can totally relate with this post as a pretty new blogger. Thank you for sharing. I'm glad you enjoyed reading this post. Thank you for visiting. Couldn't agree more! It just kind of takes over your life! It does! Blogging just occupies your mind 24x7. LOL on all of these but #3 comes to mind, big time, when pondering my early blogging days. I wanted to blog about all idea which flowed through my mind. I published 60 posts daily between 2 blogs, going bananas. But I toned it down quickly, got on niche, and began to see more blogging success when I published 2-3 posts weekly. 60 posts daily! You were on a roll. Haha. I'm glad you made your way. Your achievements inspire me. :) Thank you for visiting. Just like I checked my notification to find your comment. Haha. The things we new bloggers do! I totally agree with the things you said. I signed up for google adsense i got rejected. I am still in a process of getting adsense account approved. And writing the new post makes me feel think think think haha. Its funny we all relate to your story. Are You Genuinely SORRY When You Say ‘Sorry’?